At the Tidal Basin the other day I was reminded that the most stimulating experiences are the unmediated ones. I was educated for mediation, for middle terms that unified logical or lived discrepancies and conquered them with a category. Contradictions were to be eliminated, like dissonances in music, or shown to be false, and in their resolution lay a release. But I have lost my confidence in single descriptions, and I am a little bored with the dream of release. The world has many hooks in me now and on some of them I dangle quite happily, or at least with the satisfaction of one who can justify his commitments. 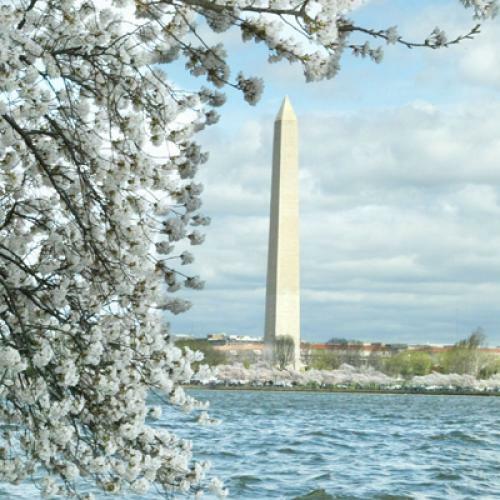 Anyway, the cherry blossoms are out at the Tidal Basin, a sweet date in my religious calendar, a kind of personal pilgrimage festival, when Washington, of all places, becomes, for a week or so, a capital of the senses and the speculations that they provoke. I know of no more regular demonstration of the beauty of transience than these trees in bloom. When it rained the tiny flowers held fast, offering the additional instruction that delicacy of substance is no obstacle to firmness of attachment. I was lying on the cold ground beneath the riot of white tenderness when the scene was broken by a nasty sound. I sat up and saw two war-green helicopters heading importantly to the White House, no doubt from the Pentagon. At the same time I caught a glimpse of the sharp skylight of the Hall of Remembrance at the Holocaust Museum in the distance: it made a tear in the enchanted natural copse by the water. I cannot say that my experience was completely ruined. This is Washington, after all, where, in my way, I also participate in the soulless but honorable enterprise of helping the state get it right; and this is what I mean by a lack of mediation. The terms collide, but they do not go together; they are alien to each other, antithetical, but they share a place, a realm. Power and beauty; policy and epiphany; blossoms and choppers: they are equally real. In the heterogeneity of the world, everything is real. Even illusions are real. There is only reality. And even before the helicopters invaded my transfigured visual field, it was hard to stay focused on the spectacle before my eyes: I kept thinking of Brega and Ras Lanuf, of Manama and Damascus. I came to clear my head, but I was arguing with the president. We always bring our own distractions. Interruptedness is our lot. There are many legitimate claims on our attention. I recalled Tu Fu, the Chinese poet of the eighth century who composed some of the most exquisite verses in the literature of blossoms. “A thick frenzy of blossoms shrouding the riverside,/ I stroll, listing dangerously, in full fear of spring.” His achievement was all the more remarkable because it took place against the collapse of the Tang empire— decadence, corruption, rebellion, defeat, exile. The poet wrote worriedly, with no diminution of lyrical refinement, about politics, and the condition of the government and the country, and his desire to find an official position. “Rivers and mountains survive broken countries./... Blossoms scatter tears thinking of us....” He lived inside history and outside history. He owed his poise to his contrasts, which according to David Hinton, whose translations I have given here, is also how his poetics worked. Or I may be guilty of a “focusing illusion.” This is what happens when you judge a whole by a part, and thereby make the object of your attention more significant than it really is. “Nothing that you focus on will make as much difference as you think,” Daniel Kahneman and David A. Schkade concluded in an influential article in 1998. That is why paraplegics can be as happy as lottery winners, and Midwesterners can match Californians in their sense of well-being. There are more, and better, qualities in their lives than the ones that are most salient to external observers. We miss their “redistribution of attention.” Kahneman, the god of the behavioral economists, has made this contribution to the inventory of contemporary wisdom: “Nothing in life is as important as you think it is while you are thinking about it.” I dislike that sentence intensely. It is another visitation of the gospel of relaxation. It is, indeed, a kind of epitaph for a shallow and scattered time. It is hardly news that the mind is inconstant and that perspectives are partial; but the inconstancy must be resisted and the partiality corrected. Otherwise we will have capitulated to a perfunctory conception of the present. Not all thoughts are alike, but Kahneman’s law is indifferent to distinctions of meaning. The most decisive feature of an idea, for the purpose of judging it, is not our experience of it. Some things are surely as important as we think they are when we are thinking about them, and for that reason we should think about them more often. We are known by our definition of those lasting things. We are lifted, or lowered, by the subjects we choose to ponder, and we have the freedom to make such a choice—the ability, and the duty, to make ourselves increasingly (but not completely) responsible for the contents of our minds. One name for that project is culture. By means of memory, private and public, we may classify our thoughts and bind ourselves to them, and to the values that determine our classifications. By means of imagination, our standards of significance may defeat time. Kahneman and Schkade cite a paper, from 1996, called “Events and Subjective Well-Being: Only Recent Events Matter,” in which “it was found that only life events during the previous 3 months influenced life satisfaction and positive and negative affect.” Three months! Did they study toddlers and puppies? I once met an old woman who had forgotten the name of her son but remembered the name of Amalek. Is it really necessary, even in this sensationalistic society, to insist upon the presence of the past? And, for that matter, upon the presence of the future, which affects our evaluation of our lives in the form of our hopes. The difference between paraplegics and lottery winners, between their adaptations to their circumstances, is not trivial. “Only recent events matter”: such a doctrine of momentariness is good advice for marketing, but it is bad advice for living. It is also an inadequate account of self-interpreting beings such as ourselves. The irony of my blossom cult is that those passing emblems never pass, not for me. When they are there, they are exactly as important as I think they are, and when they are gone, they do not suffer in importance. Kahneman’s law applies most perfectly to itself. Leon Wieseltier is the literary editor of The New Republic. This article originally ran in the April 28, 2011, issue of the magazine.